You know when you see a restaurant that instantly attracts you? Whether that’s the décor (for me, minimalism works every time), the menu snippet you’ve spied on Facebook or even the smell coming from under the door when you walk past. You make a mental note to visit as soon as you get a spare minute (and a free friend to try it with) and then never, ever get round to it. You see countless Instagram mouth-watering Instagram posts until you finally crack and think right. This is the week. Well, that’s exactly what happened to me and Tiger Rock that has been open for quite some time now on Smithdown Road. They’ve recently became so popular they have successfully opened a second branch in our city centre and that was when I knew I had to be missing out on something big. So I booked a table, begged a friend and set sail for East Asia (almost) to begin our eagerly anticipated Hawker Food adventure. 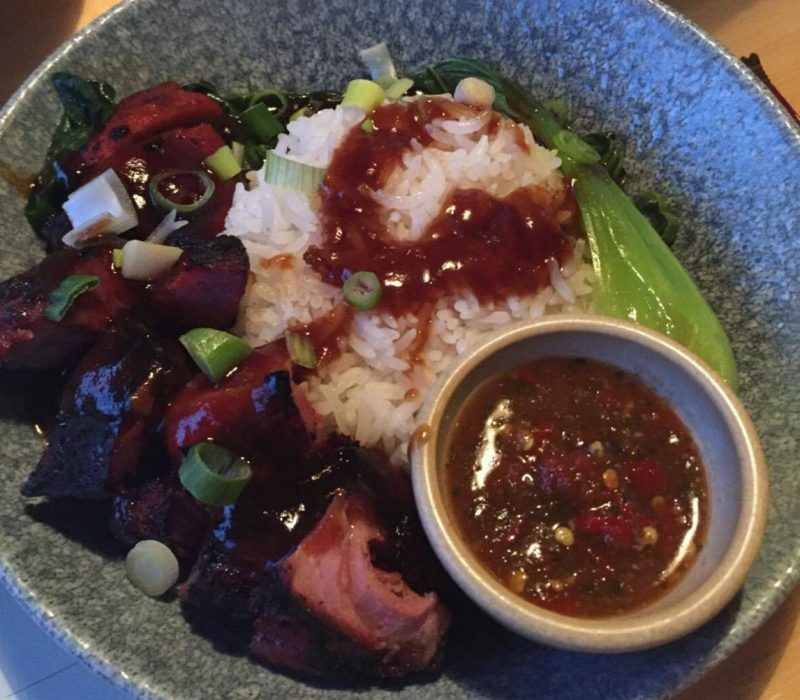 Tiger Rock specialises in fresh East Asian cooking which includes Thai, Chinese, Malaysian, Singaporean, Vietnamese and Loatian cuisine which inevitably makes for an extremely exciting menu. If that wasn’t enough, they also have an extensive gin list and even though we visited on a week night, there was no way that was going untouched! Like a lot of great independents in Liverpool at the moment, Tiger Rock offers a ‘small plates’ menu. I love this concept purely because it means you can order a ‘bit of everything’ and share – which is not only a really sociable way to enjoy food, it also means you get to try a range of dishes rather than just being restricted to one per course and with a menu as extensive as this, the urge to try everything was strong! The dishes were divided into ‘plates’ and ‘bowls’ and to be honest, much to our delight, there wasn’t really anything small about them and by the end I was verging on a full feeling that I can only liken to around 4pm on Christmas Day. The only trouble with ordering from a menu that has so many delicious choices is actually making a decision, but after a brief catch up, several sips of gin we set straight to work on the food and I made a note of every chosen dish in my phone (this gal doesn’t mess around). We ordered six dishes in total, with a bowl of sticky rice on the side and were informed (as in most places) that the dishes would just come out as and when they are ready. The wait on food wasn’t particularly long, but long enough to know everything was fresh rather than heated, which is always good. The first dishes to arrive were the ‘Rendang Kentang’ and the ‘Panang Het’ a beef and potato Malaysian curry and sautéed mushrooms in a Panang sauce. Both dishes were absolutely packed full of flavour. The curry boasted soft, fluffy potato and was generously packed with tender chunks of beef, with fresh chillies allowing it to pack a heated punch. The Panang Het was saucier than we thought it would be, kind of like a red thai flavoured creamy soup, sweet tasting and full of juicy mushrooms – perfect with our mountain of sticky rice. The rest of our dishes came out in quick succession (our table pretty much resembled an all you can eat Chinese buffet display) with gooey honey glazed pork and fresh Bak Choi, a classic (but bloody good) Pad Thai and in our eyes, the star of the show, the Vietnamese Pork Spring Rolls. I’d heard really good things about these so was excited to give them a go, and yes they were amazing. Really. A crispy outer shell filled with sweet minced pork, they were far from your typical, dubiously-filled spring rolls, but still just as moreish. The final dish to arrive was the ‘Tofu Sumbat’ – stuffed tofu with cucumber, beansprout, leek and chilli drizzled in a sweet Tamarind sauce. We chose this dish out of curiosity more than anything and whilst there are a few vegetarian options I would definitely say you have to be willing to eat meat/fish to enjoy this place to its full potential. As much as I love to try new food options, particularly vegetarian dishes, in the past I have struggled to get on board with tofu – I just find it ridiculously bland – marinated or not, and no matter how hard I try I can never get it crispy. The tofu at Tiger Rock however, was a totally different story altogether – light, crispy and full of the flavour of the Tamarind, it was a really enjoyable dish and I was glad we kept an open mind and decided to try it. In fact, I’d probably order it for a second time if I venture to Tiger Rock again (which I definitely will be doing). After the ultimate foodie banquet we almost definitely didn’t need dessert. But when the menus were handed to us and apple spring rolls with vanilla ice cream just so happened to be on there, not ordering them wasn’t really an option. After seeing (and eating) the generous portion sizes during our main course, we decided to play it safe and order one to share, which was probably a wise decision seeing as my top button was already long gone. 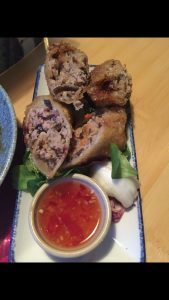 The spring rolls were super light and flaky, filled with warm sweet apply pie filling (we both said they tasted like a McDonald’s apple pie, and if you’ve ever had the pleasure of eating one of those, you’ll know that can only be a good thing). The hot filling mixed with the creamy vanilla ice cream was just divine and despite full bellies, the dish was gone in a matter of minutes. 10/10. If you want to experience authentic East Asian cuisine (and don’t have the time or money to hop on the next Emirates 747) then Tiger Rock will definitely deliver the flavour, authenticity and all the booze. The price we paid between two of us was very reasonable for the quality and portion sizes, just be prepared to roll home muttering how you’ll never eat again….before sitting down to Bake Off with a cuppa and cracking open the biscuits.